Rancho Chivato is our largest and most developed facility for receiving groups and for overnighting. With views of the Sierra Cacachilas, the Sea of Cortez and Isla Cerralvo, Rancho Chivato offers rustic accommodations that include cabin tents, a community room, a multi-purpose palapa, terraces, a small swimming pool, a bunkhouse and various flat areas for pitching tents. Joined by pathways, these elements come together to create a natural indoor/outdoor living space that comfortably accommodates our guests. We provide healthy, homecooked meals, clean, safe drinking water, other beverages, solar-heated bucket showers, sinks for washing up and fully furnished wall tents and bunk rooms. Because dryland forests are water constrained, our towels are small, our toilets are dry, and our showers have buckets rather than running water. 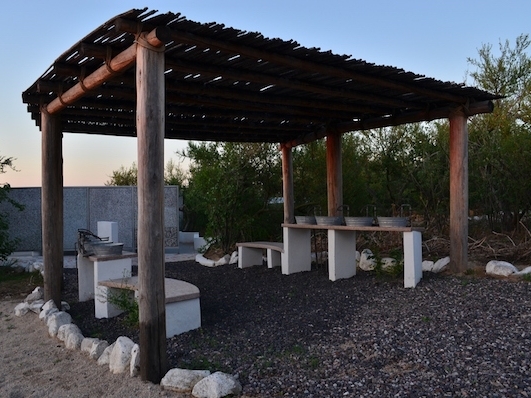 We believe that the restricted water usage for toilets and showers is more than made up for with the pleasures of the pool, the stars at night, the campfire and the opportunity to connect with your surroundings. Go to sleep with the sound of an owl hooting and wake to a sunrise over Isla Cerralvo. Ranch guides and our famous mula bars are available by request for trekking. Or, you might enjoy mountain biking nearby trails of various skill levels. In addition to those listed below right, many connect with the extensive network of the Rancho Cacachilas trail system. The large, native palm palapa can accommodate up to 70 people auditorium-style. This flexible space is available for conferences, meetings, workshops, retreats and other gatherings or presentations. Rancho Chivato regularly hosts binational scientists and researchers who study the region's unique biological and geological diversity. We also accommodate workshops and ranch retreats for a variety of groups, including companies and schools. In late 2016, we created a community room in the old ranch house with a cozy fireplace, books and games. To refresh yourself on those hot, hot days for which Baja California Sur is famous, we built a small pool by the outdoor fire pit. We also updated our kitchen facilities, where our staff prepares and serves healthy meals using (as much as possible) our own ranch, farm and garden products. Enjoy your stay at Chivato for $250 USD per person per night in our Safari Tents or $175 USD per person per night in our Chivato Resort Rooms (1 queen bed, 1 sofa bed). Minimum 2 night stay. See also our Los Pisos facility, which accommodates overnight guests.